We would expect to find stories in the nineteenth-century press about posses scouring wood and field for “wild men” or even “wild women.” The forests seemed to teem with feral, howling bipeds, either naked or fur-clad, and, like ghost-impersonators, very hard to catch. 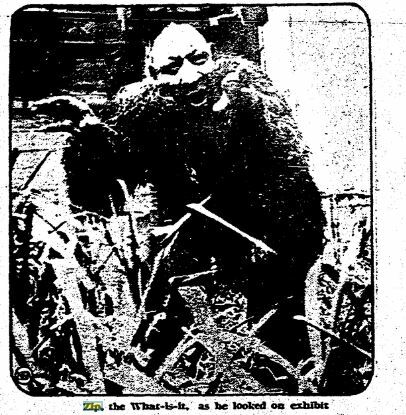 But in 1926—the rational ’20s—it is unusual to hear of a similar panic over an “ape-man” on a Connecticut farm. HUNT FOR “APE-MAN” AT STONINGTON, CT.
Westerly, R.I., March 26. New reports of the appearance of an “ape-man” in a lonely section of Stonington, Ct., near here, today resulted in a resumption of the hunt for the weird creature which for two weeks has terrorized that district. Connecticut state police are assisting residents in an effort to capture the so-called “ape-man,” whose ghostly shrieks and moans have provided many a sleepless night for Stonington farmers. A posse of farmers, all armed and led by bloodhounds, has sought the disturber intermittently for the past fortnight without success. “First reports of the appearance of the “ape-man” came from the Highland farm, where live the four Miner sisters. They described the creature as part man, part beast, with hairy face and arms. The night cries of the “ape-man” usually come from a swamp about a quarter of a mile from the farmhouse. Police here are inclined to place little credence in the report, believing the “ape-man” may be merely a masquerading practical joker. Of course, there were whose who pooh-poohed the whole idea of a monster. North Stonington, Conn., April 3. Taugwank’s “ape man” is a plain human being in fur coat and trousers. George Denison, of Mystic, a game warden, has come to that conclusion after a thorough search of the Horace D. Miner farm. Further, he declared his belief that the man was attempting to frighten Muriel 19, and Mildred Miner, 18, orphans, into selling the farm which they inherited on the death of the father, three weeks ago. The “ape man” has been variously reported by the girls and neighbors as a hairy creature of terrifying mien, slumping along in the manner of an ape or jumping about with the agility of that creature. A check of neighboring asylums and circuses disclosed no missing inmates or animals. Attention then was turned to the theory that the apparition was a man and authorities learned that before he died Mr. Miner had refused to sell the place. Despite the desertion of the aged caretaker, Frank Miller, who confessed he was terrified at the events of the last three weeks, the girls are unafraid. Then came a startling, and puzzling, admission from one of the Miner girls. New London, Ct., April 3. North Stonington’s now famous “ape man” mystery has been solved, the “ape man” has been “captured.” It was found to be nothing but a dummy and the originator of the scheme has confessed. This was the result of a state police investigation announced today by Sergt. Clifford Gorgas of the Groton barracks. The ape man dummy was found near the home of the Miner sisters, Muriel and Mildred, and was constructed, Miss Muriel Miner admitted, to scare away visitors not wanted. Directed to Haystack rock by Miss Miner, the state policemen found the dummy wrapped in a sheet with a large April-Fool sign hanging from it. It was then, the state police report stated, that Miss Muriel Miner confessed to the hoax. Thus ends a mystery which has caused considerable uneasiness in the North Stonington vicinity for more than week and a mystery that has led to the formation of at last one posse and several expeditions in search of the ape-man. North Stonington, Ct., April 5. An appeal to Robert Hurley, superintendent of the Connecticut State police, for a full investigation of the “ape-man” who has terrorized their section for three weeks, was planned today by indignant residents. Aroused by stories, alleged to have come from the state police barracks at Groton, near here that the “ape-man” was merely a hoax on the part of the Miner girls, on whose farm he has made most of his appearances, neighbors came stoutly to their defense today, scorning the state police for their alleged laxity in investigating the affair. Miss Muriel Miner, pretty 19-year-old mistress of the 2000-acre estate, emphatically denied that she has confessed the “ape-man” was a hoax conceived by her sister and she is backed by the entire community, many of whom claim to have seen the creature. Miss Miner charges that the “ape-man” is someone trying to scare her off the farm so it can be bought at a low price. Many of the neighbors agree with this theory, but others maintain it is some demented person or escaped lunatic, while a few still believe it is really some sort of animal. This begins to sound like the Fox sisters confessing to cracking their toes, then repudiating that confession. And while Sgt. Gorgas said on 4 April that Muriel confessed to the hoax, on the 6th, he said that it was no April Fool’s joke. APE-MAN MAY STILL EXIST: STATE POLICE SERGEANT SAYS IT’S NO APRIL FOOL. New London, April 6. Sergt. Clifford N. Gorgas of the Groton barracks, State police, today denies that the Miner sisters, Muriel and Mildred, of North Stonington have declared the finding of a dummy last Friday an April fool joke and not the real mysterious “ape-man,” which is said to have haunted that vicinity during the past week. Curiouser and curiouser…. But there the story ends. Gorgas was a popular local figure and achieved at least the rank of Lieutenant in the State Police. So why did he change his mind about the ape-man? I can well imagine some local donning a fur coat to scare the girls off, thinking, what do girls need with a valuable farm like that anyway? But there does not seem to be any proof. I do find it interesting that, if this was a scare tactic, the ape-man was the monster of choice rather than the more usual sheeted ghost or phosphorescent hound. It was about this time that “Zip” the “What-is-it?” or “ape-man”—one of P.T. Barnum’s prize exhibits, fell ill and there were reports that he was dying in a New York hospital. As this illustration from an article headed “STRANGE LIFE OF APE-MAN IS TOLD” shows, he wore a fur robe. So, again, if this was a hoax to scare the Miners off their farm, perhaps Zip was the source of the monstrous inspiration. The biggest problem with this idea is that the Miner’s “ape-man” first appeared in late March and I haven’t found Zip in the Connecticut papers that early. Still, he was often featured in the press during his long career and was certainly a well-known character in popular culture. Zip the “What-is-it?” Ape-man as he appeared when performing. Other ideas or a final solution to this story? Chriswoodyard8 AT gmail.com, who regretfully supposes that the best April Fool jokes are ambiguous. 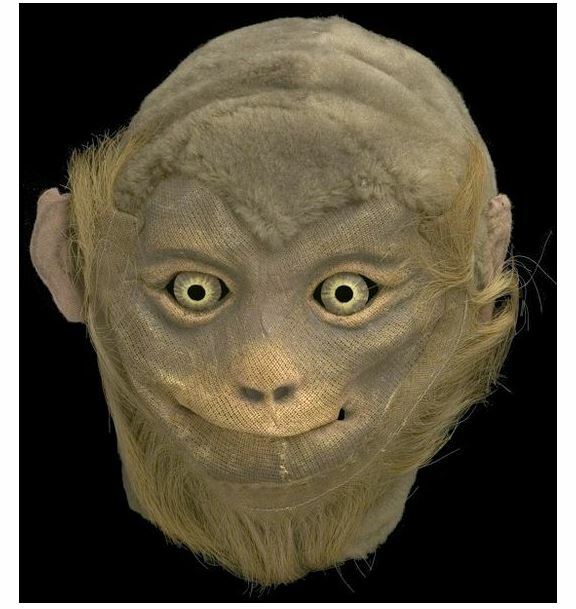 on March 31, 2018	 in Animal Tales, Ephemera, Folklore, Fortean Mysteries, News, Panics	and tagged ape man, Ape-ril Fool, April Fool, April Fool's hoax, April Fool's joke, Connecticut, hoaxes, Mildred Miner, Muriel Miner, North Stonington, P T Barnum, side-show performer, Zip "what-is-it?"